On Sunday, one of Gainesville's most recognized business owners and entertainers, Brad Heron took our wheelchair challenge and our wheelchair and went bar hopping in a different part of town. He decided to do what he normally does on that day and his staff went with him as always. We made sure that local news would be there as well. Apparently TV20 featured him in a 6 pm story and the next morning we read all about it on the front page of the Independent Florida Alligator- or so we thought. If you read the newspaper story- you'd conclude that he had a nice time. Went to some clubs, took some shots for awareness. The experiences described were not entirely void of anything deeper. He turned some heads, made some people think. And if that's all that happened - it would have been good enough. Except that it wasn't were the actual story was. What Brad described to us a few days later and what the article covered seemed to be entirely different experiences. He came out of this humbled, inspired, somewhat changed. As we interviewed him on camera this Wednesday he told us he's still processing some of the things that happened and how he feels about it. It was only 24 hours and it's not an experiment he'd gladly repeat. It was frustrating when the elevator that takes you to the pub he usually goes to wasn't running. He'd call up the place to bring out the key and they ended up hanging up on him a few times. Finally, one of the people in his entourage went up there to get it and they were pretty upset. From what we heard, everybody that came with him was upset at one point or another. He couldn't get into the restroom, he couldn't go up and down as he pleased, he felt watched and that made him uncomfortable. Some people were patronizing, telling him he can "make it" as he struggled up a hill. Not your average Sunday night. What his crew believed would be a nice, breezy experiment for a good cause turned oddly personal for them that night. He'd twirl in a chair for a little bit, talk about the Foundation and his experiences- that was the plan but it became so much more. If his experience was as carefree almost as the newspaper described it, our mission would have been much easier. And I can understand if a newspaper catering to the student lifestyle, the bar scene and the pub scene was uncomfortable with the darker, somber undertones. What was strange was the fact that the story didn't mention the Foundation at all- although Brad talked about it plenty- and ignored most of our press release. And an interesting observation: the emotions and the frustrations were real, although the wheelchair used was part of staged experiment. And yet again, a participant talking about having his eyes open and wanting to help make things better. Brad's experience affected the Foundation as well. The young writer from the Alligator, the WCJB TV20 camera crew and his staff were not the only ones following him. The director we recruited for the segment, Mike McShane is now talking about developing the Wednesday material into a short documentary. We've accomplished a lot that night- even if it's not entirely reflected in the Alligator story. Still, front page on the first day of school is nothing to sneeze at. planning a pub crawl through midtown in a wheelchair on Sunday. Rockey’s along as he visits bars in midtown on August 23, relying on a wheelchair for mobility. empowering those with disability to enjoy the quality of life that all human beings deserve. 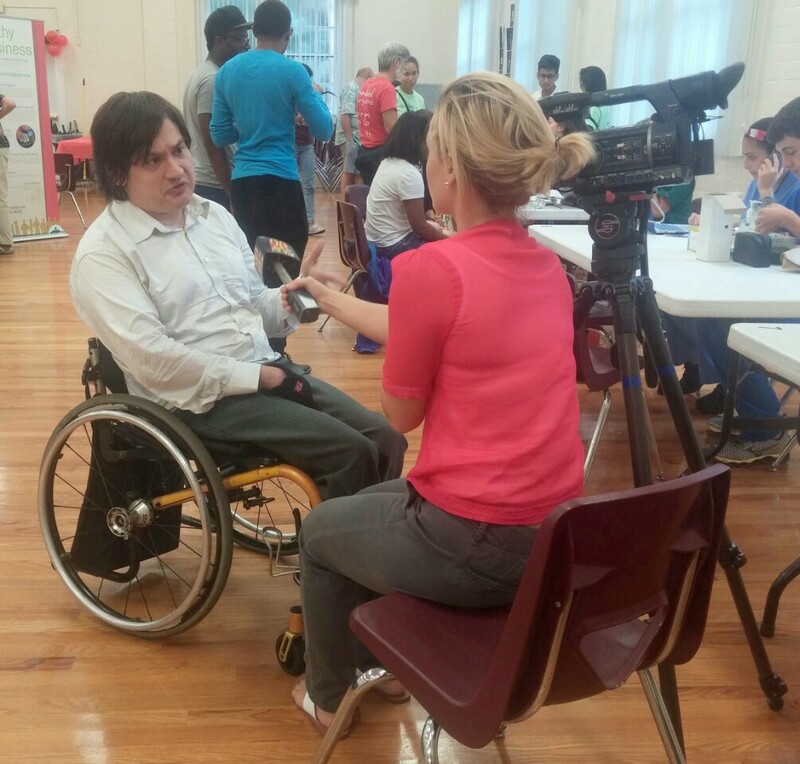 in the wheelchair to help raise awareness of disability access in Alachua. Special thanks to NuMotion for loaning a state of the art wheelchair for the Challenge. We all care about different things. We all get excited about different causes. For me- my number issue is, was and forever will be- disability. And it's not because I was looking for an issue to get involved in in my spare time, to volunteer with something or to socialize over cocktails while fundraising among the local elite. If you know anything about me- I'm sure you realize that money and as of late time- are the things of which I don't have a lot. The wheelchair- no matter what I do and how accomplished I will be in my profession- will always be the first thing people see when they meet me. It's a block or a filter for them and they will judge me through it. Along with my spasticity, my posture, my expressions. It also determines how I get around- where I can't and can go. But it would be wrong to say that I started my nonprofit and its campaigns to make things better for myself, because I think that with my education and accomplishments somehow I manage- but I do have an insight into what it must be like for others like me. We all care about different things. I have a friend who only donates to Cat Society and that's his passion. I know I was asked to join multiple Boards or campaigns where I respectfully declined, because in turn that wasn't where my passion was. So when we started the Wheelchairedforaday campaign we knew that some people would decline. Some were scared, others felt it may had been inappropriate others just didn't want to get sucked into a project. It's all fine- it's something I care about so they don't have to. Our initial idea was to give people the wheelchair experience, to have them stand (or sit and roll) with the disability community. It was thought of in a way that wouldn't require a big investment of time and effort on either part and yet be educational. Two reactions stood out as most surprising: TV reporters were told not to sit in the wheelchair because someone might get offended, and a local lawyer that I know- and for whom I had some degree of respect for the type of career he was able to build- rather than respectfully decline decided to really give me a piece of his mind and called it "superficial". I don't know if he was calling me superficial or the idea behind this challenge but either way I found it greatly offensive. I dedicated three years of my life to establish this non profit and I still don't understand why needed to knock it down. Then he started to ask: why wheelchairs, why not some other disability? To which I thought I can't be everything to everyone all at once and I got to start somewhere. And a wheelchair is what I know and what I relate to. There's a lot of great causes out there, many more worthy than mine. But we can't all be solving world hunger and I like sticking to what I know. I guess every awareness campaign has some gimmick aspect to it as they are intended to command attention and generate publicity. After months, years of talking and planning about doing things we finally did something. So yes, there was a bit of "This is us here's what we want to do and here's why, pay attention" reasoning behind it. But I have to say we were surprised with how much substance, how much data, how many different reactions we uncovered with this. It made us think how much something like that was really needed. And we never asked anyone for money. We wouldn't say no if they offered but they didn't- and what we really wanted was the experience, were the stories. And unlike some other campaigns that make people do crazy things in the name of charity- which don't get me wrong, also has merit- ours was exactly about what the Foundation's mission was. And all we asked was that people use a wheelchair. I don't think there's anything superficial about making someone experience a different way of living, being, getting around, a different mobility. And I understand everything- but why would someone be so determined to pop my balloon or let the air out of my tires? 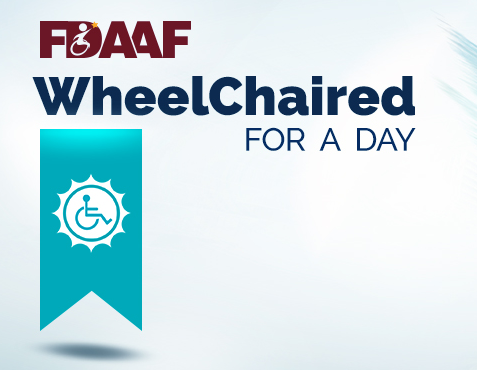 We've learnt new things while dealing with the Wheelchaired For a Day challenge this month. We still learn more every day. And I don't only mean about human nature- how our invitees and volunteers react to the wheelchair and to themselves in it. How it's a tool that many fear and dealing with it may not be as easy as trying it out for a day to make it all better. I don't even mean all the interesting ways people have turned us down after initially saying yes. I can't fault people for not wanting to do it, for not wanting to be a part of our project, for not feeling safe and secure about something that has all this negative stigma attached to it. And I can't expect people to do something I'd like them to just because I ask if it requires even the smallest investment of time and effort. It's their call and I'm always grateful and excited when they sign on and try to be gracious when they back out. But with this- we've learnt a lot about our own abilities to manage a project. To run a schedule. To contact people in the community and then follow up. To figure out how to recruit, manage and keep the volunteers interested. To operate when a videographer doesn't show up, a person reschedules or doesn't show. To figure out the most efficient way, given our limited resources - to produce videos. What I like about what we do in August is that we can afford to be flexible. That we can mess up slightly. Not to say that this project isn't important- because in many ways it becomes so much more that we've ever contemplated- but we will have more projects coming up straight after this one and there will be no room to mess up. I needed to know how we work as a team. Which volunteers should we invite back to help us with our bigger scale plans that have the potential of bringing in some money. I needed to see how we work under stress. Our Creative Director likes to have everything figured out before we get started and that's her job. These are our goals, this is the procedure, this is how things will look and feel. She might not like me saying this, but what I like about Wheelchaired For A Day and how we made made it up as we went along. How we changed things we felt were not realistic and over ambitious. How, yes, ideally 31 people for every day of August would have been a nice neat little program, but it's hard to be there to interview, film, switch out participants every day- but that's a lot of work and spacing it out - taking a day or two to take a break and regroup works better. How the project took a life of it's own. We went from "let's do a simple writeup and rely on social media" to have our participants provide us with the content and limit our amount of work and time investment to doing a before and after interview every time. Some use the GoPro Camera while others do not. One person even decided to give us 90 minutes of self made content. This project appears to have a different meaning to different people. While many go about their normal day, others use the opportunity to do wilder things- like a stage show, a concert or crossfit. I was hoping at the end of this to have a collection of pictures and videos to illustrate and to inspire, but leaving it a bit open ended in turn leaves us open to new ideas, new projects and new avenues. And gives us a life's worth of experience managing a disability project. Gives us credibility as an institution that is doing something rather than talking about it. And gets us well on the way to establish the connection, the exposure and visibility to do other things. Bottom line: as this idea progressed and evolved along with us- it became something different from what we originally planned, but that is not necessarily a bad thing. As the wheelchairedforaday project rolls along (pun intended), I'm learning new things about people's attitudes towards disability. Things I wasn't necessarily expecting. Not that I didn't anticipate problems, because I've always known that there will always be some hung ups about what being in a wheelchair is like for many that we ask, but I had hoped we can work through it. A wheelchair might not be in style- it seems like some women - although ready to try it- did not want to be seen in public in it. Many participants had natural concerns over what the experience would be like, can they make it through the day - or even use the restroom. But one thing comes across as striking- some people who were eager to try at first and seemed excited to do it appeared to come up with a list of reasons why they shouldn't and decided against it (often after avoiding us for weeks). The idea of a wheelchair seems to bring out the strangest reactions. My own Director told me that if I sat her in it for a day, she'd feel hopeless and cry. To which I had respond by asking "Why?". Truth be told, she wasn't the only one. A lot of responses that we had even from people who really wanted to do it called using a wheelchair for twenty four hours scary, intimidating, a big challenge, a great task, something they're afraid to try. I've been in a wheelchair practically all my adult life and to me it's none of those things. It's something that enables me to move around, not something that limits me, so I really wondered, where is all this negativity coming from. Whatever it is- in order to take this challenge- you have to get over whatever your fears and attitudes towards it may be- and I guess that's part of the exercise. To change how and what you think about what "a wheelchair" and "being in a wheelchair" means. The fact is- to me the project wasn't as serious as it's shaping up to be. We wanted for people to have fun, experience something different, get a better appreciation for some of the struggles someone like me faces every day, but it seems we struck a chord and all of those heavy, dark emotions I don't think I was prepared to deal with before it started. My original thought was that it would be a form of recognition, appreciation, inclusion, a bonding gesture from people who have been seeing me in mine for years. And I think many people treat this experiment as something more serious than we ever intended it to be. Why can't we just have fun and learn something new about each other and instead turn it into sad, twisted or sordid. One of the reactions I got was from a man who felt it was inappropriate, because he had a paraplegic friend. Well, I can't speak for that friend of his, but I'd love for anyone to come experience my world and my perspective. Maybe more understanding, more empathy and kindness can come out of it? There's nothing wrong with walking a mile in somebody's shoes or in this case wheeling a mile in his chair. There's a quote from Cement Garden that I like to paraphrase ( Girls can wear jeans and cut their hair short, wear shirts and boots, because it's OK to be a boy, but for a boy to look like a girl is degrading, because you think that being a girl is degrading. But secretly you'd love to know what it's like, wouldn't you? What it feels like for a girl?). The only way you can think of this project and you you being in a wheelchair as something inappropriate, shameful and taboo is if you think that being in a wheelchair and a wheelchair itself is something shameful, inappropriate and taboo. Is this what you really think when you look at me? Yesterday, the NuMotion wheelchair ended up at the Gainesville's Equal Opportunity interim Director's Office. She used it until this morning and even attended the City Commission meeting in it. We had our doubts about how she would manage, but I have to say she was a trooper. Unsure and a bit slow in her movements at first, she figured it out in a few hours. As we interviewed her on camera this morning, she had a few very poignant observations. She talked about how she felt others perceived her, the personal space as people leaned against her. How much she hated the inclines, what she assumed being a flat surface before- proved to be a challenge. She described the difficult balance between needing help in some situations and people assumed she needed it when in fact she was getting by on her own. I have to say Gwen Saffo was really excited to take the challenge and broaden her understanding. She came out on top, called the experience eye opening and I think in ways she did not anticipate. What's exciting for me, aside from all of the exciting footage we'll be be putting on the website soon- is that she genuinely wants to partner with our Foundation, FDAAF on future projects and campaigns. Her office oversees the inclusion of ten types of minority groups, although for many years it was primarily seen as a race relations forum. I must say that I'm really excited where this may go next- as she challenged some high ranked city officials to take her place. Also last night, we staged a bit of a performance as I went on live TV. She decided not to tell anyone why she was in the chair unless people asked. And we felt that this being America, in the age of political correctness people wouldn't. Even those who knew her. Instead I was asked to attend the City Commission meeting and explain her situation as it was televised. Hours before I got a haircut and styled and it was too late to put the issue on the agenda, but we've done it during the public comment part. With this - we challenged the City Commissioners and the Mayor and invited them to participate. Another TV day, another dress shirt. No word from the City Hall as to who is willing to contact us to set a date yet. But we do have high hopes. And speaking of high hopes and politics, City of Alachua Vice Mayor Ben Boukari will be rolling around on August 17th and he will attend his Commission meeting in our chair as well. Hopefully we are making waves with this project, slowly but surely- and we decided that with people both coming in and dropping out for all kids of reasons to take a more relaxed approach. New opportunities and ideas seem to open every day, so we decided to just go with the flow and see where it take us. Adapt and change what this project needs to be as we go along. And it's been interesting and stressful so far. So, here's what's been going on: We've launched a new project over the weekend. After two days of publicity for it it I'm already positively exhausted. Our first big campaign that came together more as an afterthought designed to tie all the other ideas that we have for the Florida Disability Access and Awareness Foundation together. We've struggled a bit with that form of narrative and transition - how do we go from one project to the next and to the next in a way that seem natural and have that obvious flow. The solution was suggested by our friends at The Hippodrome Theatre, one of the most established and respected cultural institutions in Central Florida. Make people experience it first hand. Show them what it's like. In the time that it takes to fundraise for your next project, have people spend 24 hours with a wheelchair. One person per day. And then the next. And then the next. Every experience will be different, but hopefully it will result in some greater understating, appreciation of their mobility and challenges and what it must be like to be, well.... someone like me. All my life I've been trying to explain my hardships- like if I was late because of the bus or the weather, and yes as you say it, people kind of get that it's difficult, but not really. You can try to talk about it, or just make others experience it, if only for a day. I was originally about to retire my old wheelchair last month, so our original idea was to pass it on from person to person to literally have them walk a mile in my shoes or should I say wheel a mile in my chair. My replacement didn't come in as early as I had hoped- and I don't think I would have felt comfortable giving someone my old chair anyway, given the pitiful shape it's in. 11 years old and shows. So instead, we reached to Danny Leibach who fitted me for my Kuschall eons ago and his equipment distribution company, NuMotion provided us with a wheelchair for the month. A folding and light "Quickie" brand product. I personally go for the rigid, active and sport models, but this actually might be a better solution for a casual user. A good compromise between speed, durability and light weight. With this campaign we reached out to students, politicians, artists, local celebrities, lawyers, anchors and actors but we also encourage them to challenge someone of their choice. If you are in Gainesville and you want to experience something different, sign up by dropping us an email at challenge@wheelchairedforaday.org. And visit http://wheelchairedforaday.org We will interview you on film before and after, equip you with a GoPro HeroHD camera to put on your head and we will encourage you to take a lot of selfies and pictures, share your thoughts on social media, all with a hashtag #Wheelchairedforaday. We are looking for a diverse group of participants, so why shouldn't you be next? Most importantly have fun doing it and pay attention. Every Wheelchaired day starts and ends at the wonderful Gallery of the Hippodrome Theatre in Downtown Gainesville. The Hipp and its staff have been extremely supportive through this, and I will not lie by saying that it's my favorite place to check out a plays in town. I see a production every month and a movie every week. It's good to see an organization with a shared vision for the community. Our challenge is just starting, but we'll be there on most days. Join us, you know you want to. I was on the news again this evening. A local station had a story about the 25th anniversary celebration of the Americans with Disabilities Act and I was there launching my non profit's first awareness campaign. They only used a few sentences from me this time, but they'll be back on Sunday to do a proper feature on it. Two things I found interesting. Out of all the length of the entire interview that went on for a few minutes and throughout which I felt I was overall pretty eloquent, they'll always find and use a line that I'll say in passing, a throwaway and where look angry or annoyed. No wonder I hate watching myself on TV. And could I be shown from a more awkward angle? But the thing that surprised me the most was the caption. It said "local man launches campaign" or something similar. All of the sudden I'm from here, all of the sudden I'm "local". I used to be the "UF student protesting LSAT" or the "Polish immigrant [who] wants to stay in the US". Last time I was a "Florida lawyer speaking at a Congress in Munich. At what point have I transitioned from being excitingly foreign to somebody from here exactly? At least last time I was a "lawyer". Now I'm just a "man". A local man of all things. Have I gotten so unremarkable that there are no other ways to describe me? I think I used to be so much more. Now I don't seem to deserve any better adjectives except the ones that describe where I live. Other than that, this weekend marks the launch of our Wheelchaired for a day campaign in preparation of which I was pulled away from my blog and most other duties- stay tuned.